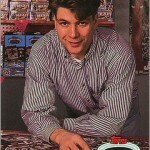 Before he would score one of the most famous goals in New York Rangers history (“Matteau! Matteau! 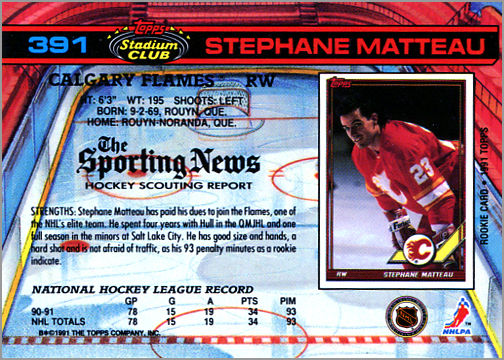 Matteau!“), Stephane Matteau was a young winger on a stacked Calgary Flames team. 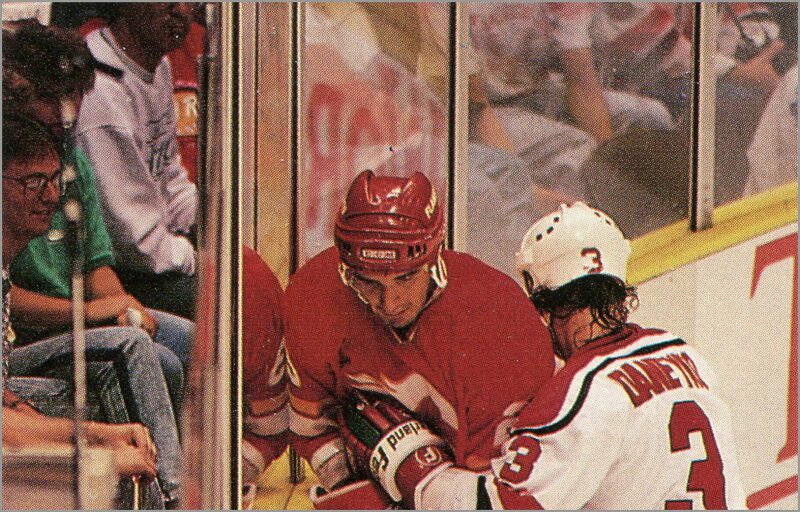 He played 78 games for the Flames in 1990-91, so there should have been plenty of photos of Matteau for Topps to choose from for Matteau’s 1991-92 Stadium Club hockey card. But for some reason, they picked this picture, which fails on so many levels that it’s kind of sad. Where to even begin? 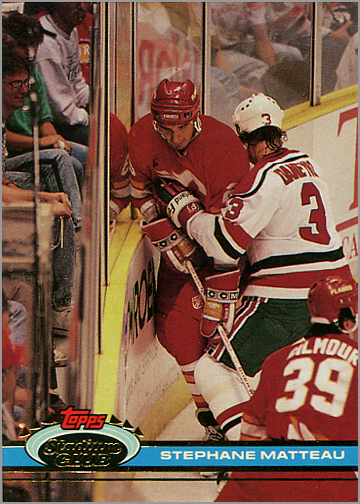 Well, this is Matteau’s card, and here he is, getting splatted into the boards by New Jersey Devils defenseman Ken Daneyko. 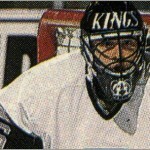 But even that action is partially blocked by Doug Gilmor, so it isn’t like it is all that great of a photo to begin with. Matteau is looking down, so we don’t get a good look at his face. Trading cards are supposed to, you know, show us what the player looks like, but this card really doesn’t do that all too well. The back, which pictures Matteau’s first Topps card, actually does a better job of showing us his likeness than the front. What really bothers me about this card, though, is the awkward angle that the photograph was taken from. 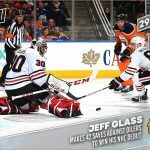 It is almost as if the photographer was straddling the glass when he took this picture. About 25% of this photo is taken up by the glass, boards and audience in the front row. Heck, we get a better look at the guy in glasses, smiling at the hit — a Devils fan, no doubt — than we do of Matteau’s face. I wonder if the smiling guy behind the glass ultimately turned into some infamous serial killer or politician (one and the same)? That way this Step-On-My-Toe could emerge from the 10 cent and common caves to Ebay stardom. I have four of them right here that I would be willing to part with for, oh, $40/each, in anticipation of the ultimate inflation to $100. Let’s call it an early bird discount! 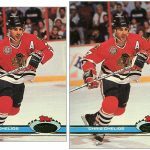 The major issue with 1991 Stadium Club hockey were the terrible pictures chosen for most of the cards in the set. 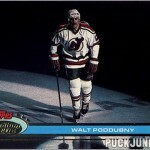 Unlike the 1991 baseball release which gave collectors memorable cards it really does look like Topps made the hockey release an afterthought and just used whatever photos they could locate of any given player even if that picture was absolutely terrible. 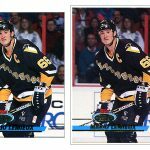 For a product that was advertised as top of the line and groundbreaking in photography it really left a bad taste in many collectors mouths when they actually saw the final product for the hockey release. You are spot-on with your analysis. The 1991 TSC baseball set did have some memorable photos. Also, baseball is easier to photograph as far as lighting goes, since most games happen outdoors, and many during the daytime. So, the TSC baseball set had better photos that were of better quality, while the TSC hockey set had dark photos that were also uninspiring.